This winter has been especially tough on us, our business and our commercial flooring. That’s why, today, we’re going to look at the best way to clean tile floors. This winter, road crews have used more road salt than ever. Many towns even used up their entire winter’s supply by Valentine’s Day. And, while we all know the toll road salt can have on our vehicles, we rarely think about the toll it’s taking on our expensive tile flooring. Although the best way to clean tile floors is to hire a professional, just as you would take your car to a carwash to remove road salt residue, we’re going to give you our best advice on how to clean your tile floors in 8 easy steps. Start by sweeping or vacuuming the floor to remove any large debris. Mix 1/2 cup vinegar with a gallon of water. Distilled water will help leave a streak-free shine. Pour 2-3” of cleaning solution in the bucket. Mop the floor as usual, changing the cleaning solution as it gets dirty. To remove any stains, make a paste using a 50/50 mix of scouring power and water or baking soda and water. Rub the paste on the stain with a cloth or sponge and allow to sit for 10 minutes, then scrub the area removing all paste. Clean the grout. In most cases the 50/50 solution can be applied to dirty or moldy grout with a soft brush to remove the stains. Wash the grout with clean water when finished. Since road salts can rust metal, it’s not uncommon to have rust stains around pipes or fittings. To remove, simply place rubber/latex gloves on both hands, dab a rag with kerosene and rub the stain. Make sure to rinse the area with warm water or cleaning solution when finished. When finished, buff the tile with a dry towel to remove any remaining water residue for a great shine! Warning: If you choose to use harsher cleaning agents, DO NOT use products containing bleach and ammonia together, especially in an enclosed area. This creates toxic fumes that can be deadly. Of course, this can be an arduous process for most business owners. 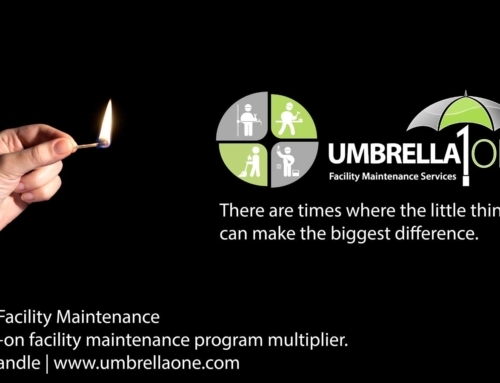 That’s why we here at UmbrellaOne make commercial tile floor cleaning part of our regular nightly janitorial services, to not only keep your business looking good but to protect the investment you’ve made in your commercial flooring. Call us at (855) 934-2635 for a free site evaluation today.